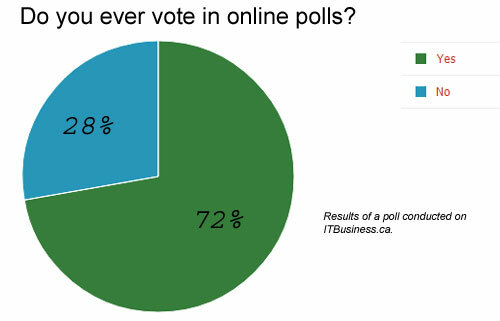 The creditability of online polling is being called into question by a poll that’s been running on ITBusiness.ca since March 29. When posed the question “Do you ever vote in online polls?” and given the choice of “Yes” or “No”, about 28 per cent of respondents chose to ironically answer “no.” The obvious absence of a 100 per cent of results being in the affirmative not only calls the practice of online polling into question, but creates a double-bind paradox that threatens to drive mad any statistician that examines the result. The result of nearly one in three online poll takers selecting “no” can’t be explained by standard error models, which allow for a deviation of three to five percent. The only possible explanation that remains is that poll takers stared at their two options, knowing full well the right one to click, and still defiantly clicked the other option to spurn the author of the poll (me). It’s likely these individuals were madly cackling all the while, and have a deep inner desire for anarchy in society at large. The only encouraging result of the poll is that about two-thirds of people willing to take the time to click answer bubbles on the Internet are still dutifully answering the questions posed to them by their oppressive machines in an honest manner. Ramifications of the poll are certain to rock the foundations of many online services entirely dependent on strangers answering questions honestly online – such as online dating, online stock trading services, and consumer survey houses.